American River College’s Vocal Jazz ensemble has been invited to play at the Monterey Next Generation Jazz Festival, one of the most popular jazz festivals in the country. Only six ensemble’s in the United States are selected to go each year and ARC has been selected for the past three years. In preparation for the upcoming event, the ensemble is dedicating up to 16 hours a week of rehearsal. “This is one of the biggest jazz festivals in the country so I’m a little nervous” said Gabe Catabran, music major and also the lead baritone. According to Professor LaPierre, director of the vocal jazz ensemble, ARC’s jazz ensemble was selected because of how well last year’s team did. “This will be my first time going to the Monterey festival and I’m really excited,” said Catabran. This year’s jazz team is completely new aside from the lead soprano and some members are even new to singing jazz, like Catabran. “I’m trying to get into the overall feel of how jazz is supposed to go because I’m mostly done classical.” said Catabran. This year’s ensemble has been together since August and will remain together for an entire year. The jazz team mostly covers classic for jazz or blues artists. “We are covering the Peggy Lee classic ‘I love bein’ here with you’’” said LaPierre, director of the vocal jazz ensemble. Jenna Magaziner, an alto and also the handler of the business and administration information, said that her favorite piece to cover is “‘Groovin Hard’ by Don Menza and she’s “excited to cover it” for the first time at the Monterey Jazz Festival. 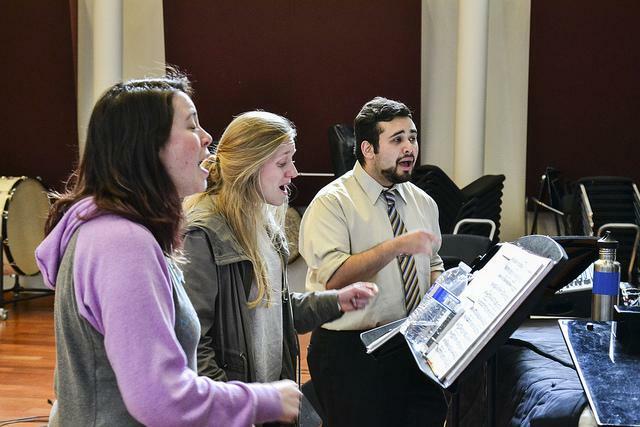 ARC’s vocal jazz ensemble will be participating in the festival on Apr. 10 for third year in a row. Be the first to comment on "ARC’s vocal jazz ensemble set to perform in Monterey Jazz Festival"